And so here we are, one year later on a 12-month round-the-world trip…a 12-month trip that has turned into a 16-month round-the-world trip. And we couldn’t be happier for it. I will remember my old strength and all my forest affairs. I will go out to my own kind, and the wood-folk in their lairs. I will forget my ankle-ring and snap my picket stake. I will revisit my lost loves, and playmates masterless! —Rudyard Kipling, "Song of the Elephants"
His name was Maximus, and it was said that he was the tallest elephant in all of Thailand. Certainly the was the tallest ele in Elephant Nature Park. Estimated to be in his 70s, Max had an elegance and grace about him that belied his enormous size and defied his many injuries. As with so many of Elephant Nature Park's residents, the story of the life he led before arriving there is a sad one. I'll not burden you with it here – those interested in knowing more can get a bit of the flavor of it all by reading his biography at the Elephant Nature Foundation website. Suffice to say that when Max at last arrived at the Park he was in bad shape. His right front leg had been badly broken and had never fully healed, he was riddled with other, smaller injuries and wounds, and he was terrifyingly underweight – perhaps by as much as 1,000 pounds. He was old and frail and in more or less constant pain, and he had probably never known any human to be especially kind. It was then that he met Karl. Every elephant at the Park has a mahout, a handler who stays with them throughout the day to make sure they stay out of trouble and that they don't leave the Park grounds. 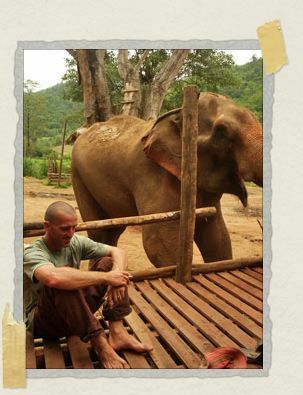 Max's mahout when he arrived at the Park was Karl. In the years that followed, under the tender care of Karl, Max improved tremendously. Because of the injury to his front leg, he walked very slowly, and with a peculiar backward slope. But he began to put on weight, and his other injuries began to heal. He didn't trust people, having never been given reason to in his long life, but he came to trust Karl entirely. The rest of us took care to avoid getting within "trunk-range" of Max. 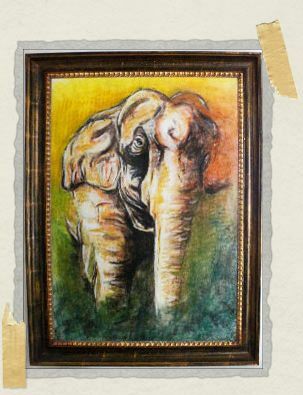 He was an enormous ele, but people made him nervous. If you got too close (particularly if Karl wasn't around), he might get scared you were going to hurt him, and he might take a swat at you to defend himself. Karl, on the other hand, would spend every afternoon face-to-face with the big guy, standing on a platform and carefully cleaning out an abscess on Max's face. Sometimes a recent arrival or day visitor would see this ritual and remark that it was "disgusting." They couldn't have been more wrong. The closeness that Max was allowing, the trust he had in Karl even after everything people had done to him, well to me at least it was beautiful. Because of the angle at which Max stood, and because of his enormous height, he was one of the most recognizable eles at the Park. This, combined with his old age and the aura of grace and nobility he gave off, made him a real favorite among visitors and volunteers. 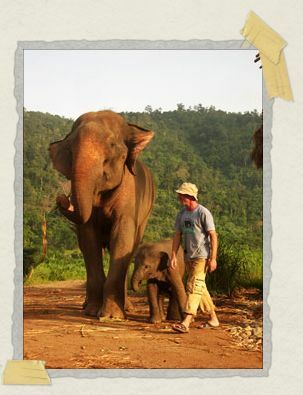 For this reason, when we introduced the fostering program a few years ago, he was one of the first eles to participate. When we re-launched the Elephant Nature Foundation website after a complete overhaul in 2007, I wrote on HedgehogsWithoutBorders about how my mother had celebrated by fostering eles for me and for Jessica. In that entry, I wrote about how I asked for her to foster little Tong Jan in my name, and I wrote about why. 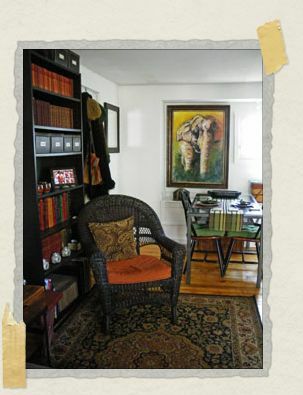 I didn't mention the elephant she fostered for Jessica: it was Max. On our second week at the Park, Jessica and I noticed a painting of Karl's was for sale at the gift shop, and decided we'd buy it before we left. Of course, a few days later, someone else bought it. We were crushed. We'd been so looking forward to being able to take home something like that, to hang it in our living room. We'd think of the Park and of Karl every time we looked at it. When we talked with him later that day, we asked him how often he painted things for the gift shop. Did he know if they had any other paintings of his for sale? Karl smiled at us, and asked how long we were staying. When we told him we'd be there another few weeks, he nodded. "That's enough time. I can paint you something, sure. What would you like me to paint?" He paused, and then with a grin he added,"And I don't do Bellys." We laughed, and talked with him a little about who some of our favorite eles were. Jessica had formed an early attachment with gentle Lilly, the former methamphetamine "addict" who now liked to take things very slowly. I was partial to (and fiercely protective of) misunderstood Mae Dta Keow, whom I once heard another volunteer cavalierly referring to as "the evil elephant." On our last evening at the Park, Karl took us aside for a moment. "I don't want you two to think I'm being rude by not staying to celebrate your last night here," he told us, "it's just that I have something I promised you I'd do that I have to take care of." We'd completely forgotten about our "painting" conversation with him, and were touched beyond words. At breakfast the next morning, Karl presented us with what he'd done. He prefaced it by telling us that he knew we had talked about our favorite elephants. "But I knew that if you really took a little more time to think about it," he said, "you'd realize that of course Max is your favorite elephant. And this is the biggest piece of canvas I've ever worked on, and Max is the biggest elephant in Thailand, so it's only right." When he unrolled it for us to see, Jessica and I had tears in our eyes. It was just stunning: a marvelous charcoal drawing of Max in the jungle, gorgeous beyond measure. Agog, we asked him how much it would be. He shook his head at us, laughing. "Don't be silly," he said, "this is my gift to you." We came home from our trip with a lot of special memories, and a lot of precious treasures that recall those memories. But (other than Belly, of course) nothing else even comes close to our Max. He's at the center of our tiny cottage, and every day we look at him and think of our time at the Park, and of Karl, and of Max himself. Karl left the Park a year or so ago to take a job working with elephants at the Steve Irwin Zoo in his native Australia. I'm sure saying goodbye to Max must have been hard for him, but I hope he was proud of the recovery he'd shepherded. Especially so deep into his old age, Max's recovery had been astonishing. He'd even started entering musth again, a period of increased testosterone similar to "heat" in dogs. While in musth, male eles can become very aggressive and dangerous to people and to other eles, so at the Park they are kept on a chain during this time. Karl had always said he had mixed emotions when Max was in musth: on one hand, he hated having to seem him on a chain; on the other, though, he was so proud to see the old man in musth. Elephants generally only go into musth when at their physical peak, so that pride was well-placed. Max was very popular with the female eles at the Park, and never more so than when he was in musth. Because he was chained during these times, they had to go to him, and that they would in droves. Jodi Thomas, who lives at the Park, often opined that the old man's popularity was because he was never in too much of a hurry to stop and cuddle. Max was also incredibly popular with some of the young bulls at the Park, particularly Hope (the chubby "clown prince of the Park"). Young Hope would follow the old man for hours, presumably trying to learn a thing or two about being a grown-up. And while he loved nothing more than to wrestle with most of the adults, and was very good at goading them into tussling with him, Hope never got pushy with Max. Maybe he respected him too much. I wrote some time ago about a tremendously emotional rescue I took part in, of a heartbreakingly injured elephant named Nitnoy. Nitnoy was renamed Medo ("beautiful") when she arrived at the Park, and her life since then has been beautiful indeed. And in time she got to be very close with old Maxie. Perhaps the two of them bonded over their injuries, or over how much a good soak in the river would always soothe those injuries. Whatever the reason, they took to spending time together often. I smile to think of the two of them lazing away a hot afternoon, squatting in the river with the water up to their eyes, their trunks peeking above the waterline so that they could breathe. But all good things, as they say, come to an end. Max's old age was starting to catch up with him. During his last musth, the big guy had been so enthusiastic that he'd really over-exerted himself. The arthritis that had long been taking hold in his injured joints was beginning to make it too painful for him to stand. Elephants are so heavy that if an ele can't stand up, they're slowly crushed under their own weight. By now, Max was needing the help of a crane to get him on his feet in the morning. Karl received word that Max was fading, and immediately returned to Thailand. He was at Max's side when the gentle giant drew his last breath. We were so very lucky to have such an amazing being as Max in our lives for the past six and a half years. His presence will be greatly missed by all who knew him, human, elephant and even the dogs. Max was a living example that despite past hardships, one can always move forward with dignity and a gentle, peaceful character. Over the past weekend, Jessica and I formatted and sent out that newsletter, and also sent out a special message to Max's foster parents, telling them what had happened. We were in tears virtually the entire time. I hate that Max is gone. It still feels so raw and painful whenever I look over at his picture. But I treasure, I treasure how happy his final years were. After all he'd seen and endured in his long life, I treasure that he was able to end his days surrounded by people and elephants that loved him. Rest in peace, Max. You will be sorely missed by so many of us down here. Sweet Max, be at peace. Thanks, Greg. He was a good ele. I know you were one of his foster parents, and I bet that meant a lot to the big guy. You two were framing Max on the night that we first "met"; in fact, he was the reason that you were running late. "Max was a living example that despite past hardships, one can always move forward with dignity and a gentle, peaceful character." I had totally forgotten about that! Tim and I were rushing around like silly people trying to frame him properly before you came. Heh. Our being silly people is also why – when you look really closely at the frame in person* – you can find one of Belly's hairs in-between Max and the glass. Us hedgehogs were very determined to decorate! Belly hairs be damned! *You should do this, in fact. You and your Texan should come up here in person to witness the framed Belly hair in its full glory. We could also enjoy the Cape and some good food and much drinkage too, of course. 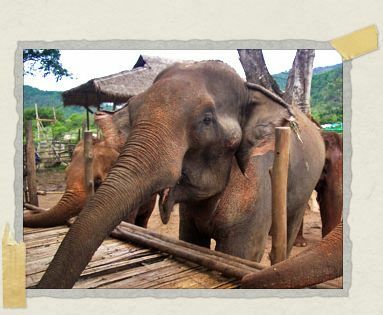 Dear ole' Max – who was a big fan of socializing (mostly with lady eles) – would very much approve of this plan too.